Remove the giblets and neck from the chicken and discard or freeze for gravy making. 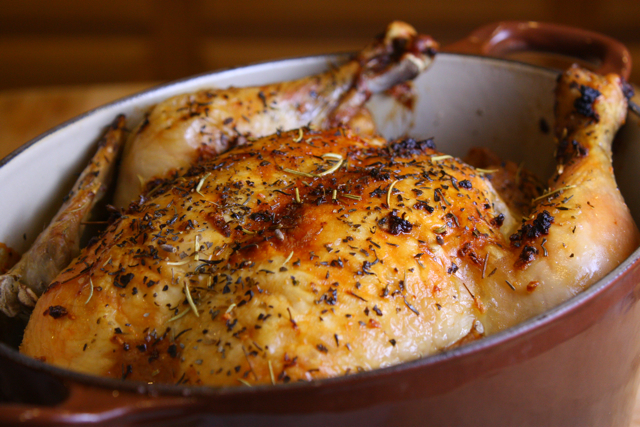 Do not wash the chicken as this prevents the bird from crisping up during roasting and washes away flavour. Season the cavity of the bird. Put all of the garlic and thyme into the cavity of the bird. The amount of garlic or type of herb used can be altered to suit individual tastes. Truss the bird. This means to bind the legs and wings of the bird close to the body of the bird so that the breast meat is protected during cooking and the finished shape of the cooked bird is pleasing. Rub the outside of the bird with the extra virgin olive oil and season. Place the chicken, breast side up, in a pan large enough to hold it. After 30 minutes, baste the bird with the fat from the pan. Basting will give the finished chicken crisp and golden skin. Return the bird to the oven and continue to cook for another 15 minutes, again removing and basting the bird. The chicken is ready after 1 hour of roasting or when a thermometer reads at 150°F. Remove the chicken from the oven and place in a warm place, loosely covered with aluminium foil and let rest for 5 to 10 minutes. Remove the trussing string and carve. When I made this I made green beans that were boiled and lightly buttered, glazed carrots and wild rice. It all went together very well.